A bill introduced in the US House of Representatives on Tuesday, February 28, seeks to celebrate the 50th Anniversary of the Pro Football Hall of Fame with clad, silver and gold commemorative coins during calendar year 2016. Introduced by Rep. Jim Renacci [R-OH16] as the Pro Football Hall of Fame Commemorative Coin Act and numbered H.R. 4104, the bill calls for the U.S. Mint to produce up to 50,000 $5 gold coins, 400,000 silver dollars and 750,000 clad half dollars in collector qualities of uncirculated and proof. "I am honored to have the opportunity to help commemorate the 50th Anniversary of the Pro Football Hall of Fame," Rep. Renacci said Thursday in a press statement. "Professional football is the most watched sport in America, and almost nine million people have visited the Hall to pay homage to heroes like Vince Lombardi, Johnny Unitas, Jim Thorpe, and of course Paul Brown, the man credited with founding both of Ohio’s professional football teams." Designs of the coins would be "emblematic of the game of professional football," with each coin bearing its denomination and inscriptions of the year ‘2016’, ‘LIBERTY’, ‘IN GOD WE TRUST’, ‘UNITED STATES OF AMERICA’ and ‘E PLURIBUS UNUM’. Coin specifications, including size, weight and metal composition, would be identical to other modern commemorative coins struck by the U.S. Mint. 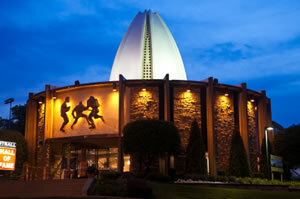 The Football Hall of Fame (www.profootballhof.com) opened in Canton, Ohio, on September 7, 1963. Since then, the museum has grown from its original 19,000 square-foot size to 85,000. It houses the world’s largest collection on professional football with 20 million pages of documents including nearly 3,000,000 photographic images. The museum is currently undergoing another expansion that will take it to 118,000 square feet by year 2013. "In order to preserve the explosion of artifacts and documents that have come into the Hall due to the growing popularity of pro football, the Pro Football Hall of Fame is expanding its research, education and historical preservations for future generations," said George Veras, President of Pro Football Hall of Fame Enterprise. The Act "will help raise the Hall’s level of visibility and give fans the opportunity to own a keepsake that shows their support." Should H.R. 4104 become law — it must pass in the House, Senate and get signed by the President for that to happen, it would support the museum as sales prices for each coin would include surcharges paid to the Football Hall of Fame in the amounts of $35 per $5 gold coin, $10 for each silver dollar and $5 per half dollar. H.R. 4104 has been referred to the House Committee on Financial Services. Similar legislation (H.R. 2527) seeking to commemorate the Baseball Hall of Fame passed in the US House of Representatives on October 26, 2011. I guess if a multi-billion dollar coporation like baseball can get government money then why not football? Afterall, football is struggling to get by on the hundreds of billions of dollars they make every year – I can see why they need a coin. Please stop with the sports coins – there has to be other subjects that deserve to be recongnized in this country. Do we really need to recognize people that get paid millions of dollars a year to play with a ball? Yet another joke from our “leaders” in congress. More government waste for coins that will have almost no demand. How about making the silver eagles and stuff people care about more affordable? All this fluff raises costs. how long does it take to reprice something? Took me about 30 seconds. NO… there are other, more worthwhile endeavors to commemorate then the multi-billion dollar federally protected football industry. Give them a copper medaillion. The US Mint has not done a sports commemorative since the 2002 Salt Lake Olympics. This one is probably a good idea. Get those sports fans back into coin collecting! I have to say, the US has a World Cup commemorative coin (soccer) but we don’t have a coin commemorating the unofficial national sport (football)?